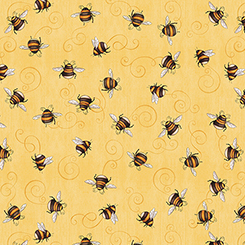 Buzzing bees and seed packets are just a couple of the creative and fun prints in this new collection by © Dan Morris. Gardeners will delight in these pretty prints showing the necessities to grow those flowers and vegetables! The tonal medallion print is a great coordinate in soft yellow, pink and green. Create inspired gardening aprons or kitchen décor with this lovely collection!